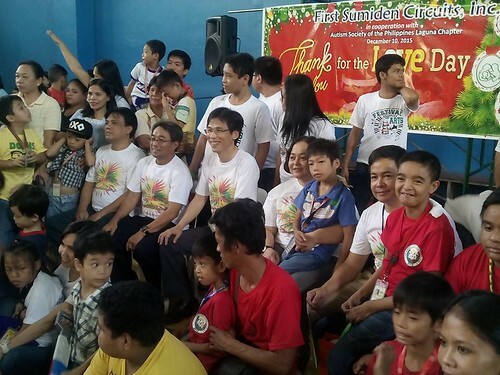 Children with disabilities in Laguna attended on 10 December 2015, the Daop Palad Outreach Program, an annual event conducted by Cabuyao-based First Sumiden Circuits, Inc. (FSCI), held at the Gymnasium of Light and Science Park I. The 150 participants came from different parts of Laguna province -- the cities of Cabuyao and Calamba and municipalities of Calauan, Bay and Los Baños. The participants were ferried using FSCI shuttles. They were joined by ASP Laguna Chapter officers along with the participants' parents and teachers from participating centers. Food, brought in courtesy of a Jollibee branch based in Cabuyao, was served by FSCI executives. Games were hosted by staff from the previously mentioned Jollibee branch while the participants were entertained by an FSCI employee with a song. Not only that, participants rendered song and dance numbers, especially Genesis Elizon who sang God Gave Me You and some students from Cabuyao and Calamba SPED Centers which gave rousing dance numbers. ASP Laguna Chapter and the parents of the children are grateful to FSCI employees and executives, namely Ted Shimomura (President), Cecile Leonoras (Vice President), Roy Baldo (Senior Vice President), Gene Mendez (QA Executive), Ariel Sanchez (Engineering Executive) and Renz Magnaye (HRD Administrative Group Head). ASP Laguna Chapter would also like to thank Mr. Rey Landicho and Ms. Russell Hizon for the extended efforts and time in coordinating with the event and the teachers of the participating schools and centers.